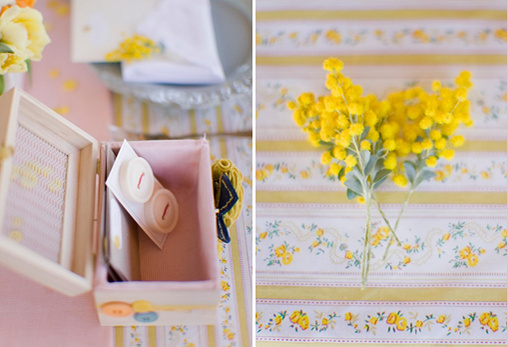 Thank you for stopping by and coming to see part two of our shabby chic bridal shower. Shot by the lovely Jessica Claire Photography. Please be sure to stop by later today there is still more prettiness that wish to share with you. 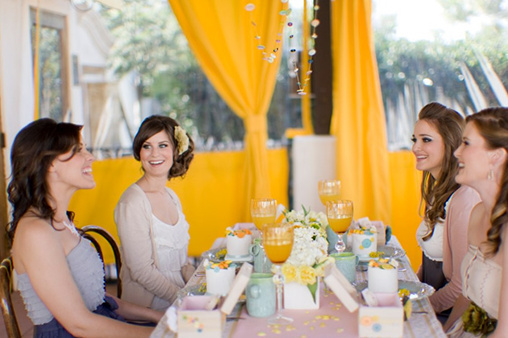 Read on to see how Carter and Cook Event Co. pulled together this adorable event. Because spring is right around the corner, they wanted a look that was fresh, fun, feminine and unique! 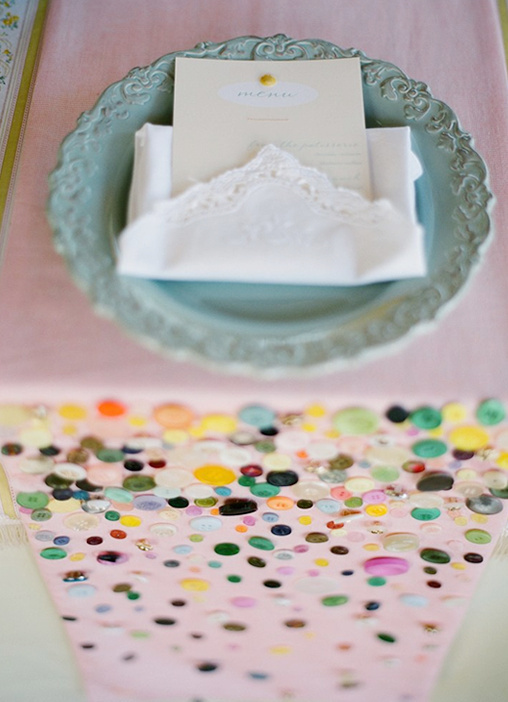 They chose shades of yellow, sea blue, greens and mixed in bits of tangerine. All clean colors to reflect the vibe of Cafe Mimosa. The soft green dishes were found at found at TJ Maxx for $4 a piece! The stemware and mugs where bought at our favorite shabby chic hang out, Anthropologie. That table cloth and runner was custom sewn. The floral pattern overlay which was delicately lined with a fun fringe. The cuter than life baby pink table runner was also custom made. They took a stripped tangerine and cream piece of fabric and glued hundreds of buttons on the ends of the runner. The variety of buttons were collected from Michael's, and Etsy. It was basically a button bonanza. So onto the cakes, how adorable are these? 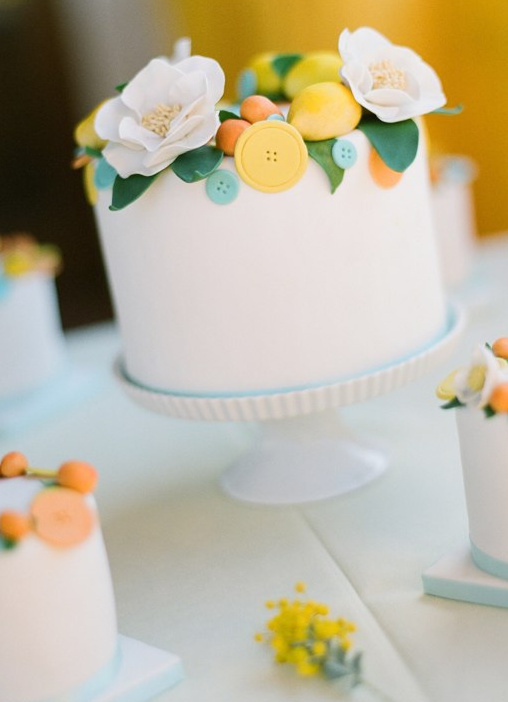 Erica O'Brien Cake created a bridal shower sized cake and a mini cake for each place setting complete with fondant lemons, kumquats and buttons. These are serious cuteness. 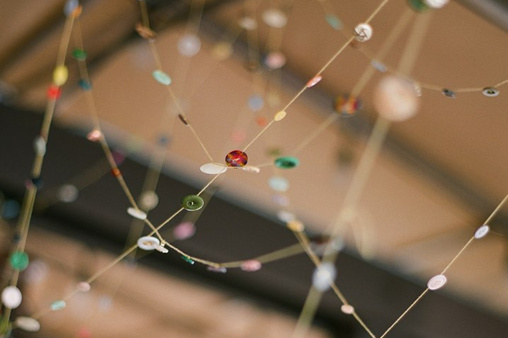 The button garland!! Truly a labor of love, but so worth it! It really makes the space beautiful and unique. Carter and Cook Event Co strung each button one by one to make various draping levels of button garland. 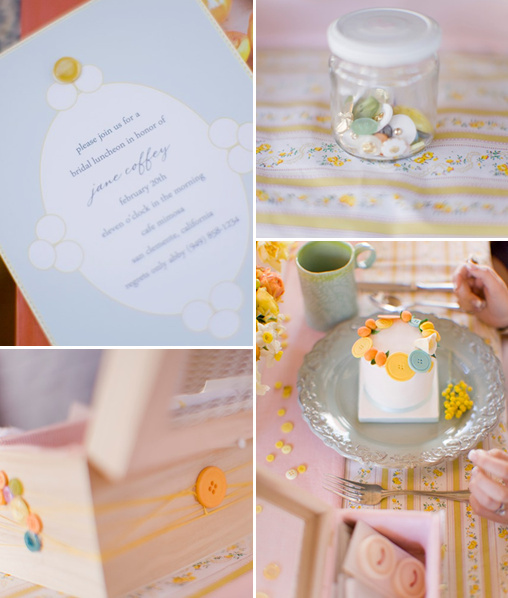 The adorable menu's, place cards, and invitations were hand stitched and adorned with button by the fabulous Paper and Thread! I love the flowers they immediately stood out to me as pure perfection. 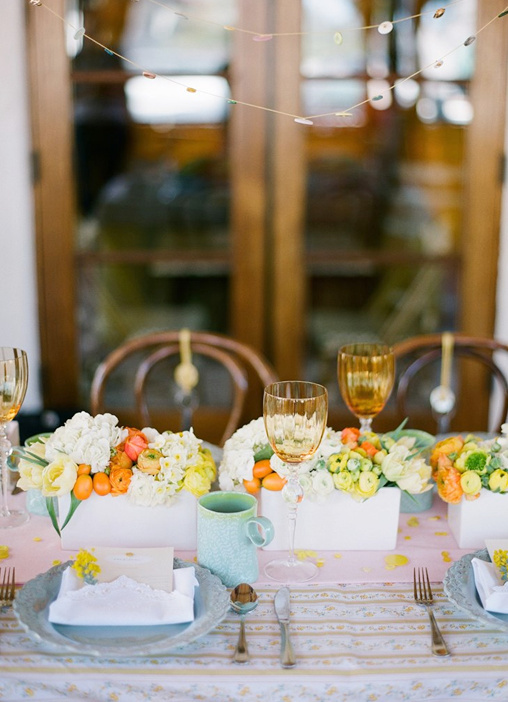 The Floral Lab created a beautiful centerpiece for this shabby chic tablescape. She used beautiful orange ranunculus, tulips, hydrangea, mini daffodils, Craspedia (billy balls) and my personal favorite, Kumquats. The florals were done in three simple white rectangular vases to keep our look clean and fresh. Excellent job, don't you think? 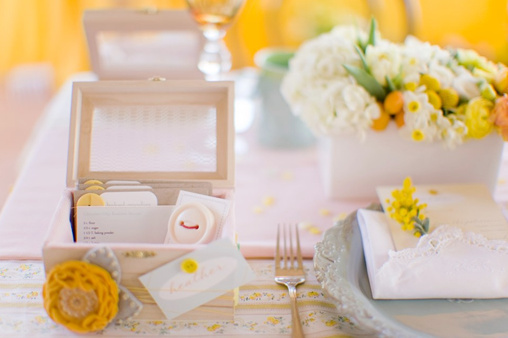 To keep in the 'brunch' theme, each guest received a wooden recipe box full of favorite recipes. The recipe box has an Ink and Button hair piece, which each girl can wear in their hair, or fastened a sweater! Tied on the back of each chair was a set of measuring spoons for an added touch! A special thanks to all the lovely models that made the day happen. 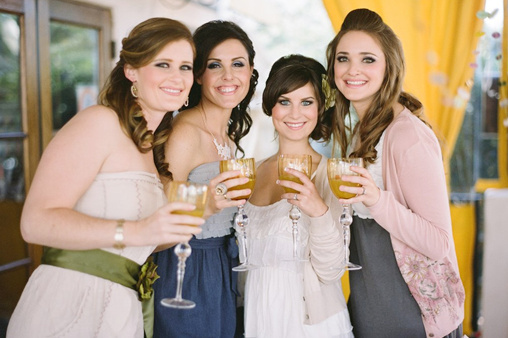 Katie and Ryan Scott, Lauren Bullock, Rachel Castillero and Katherine Carrington.